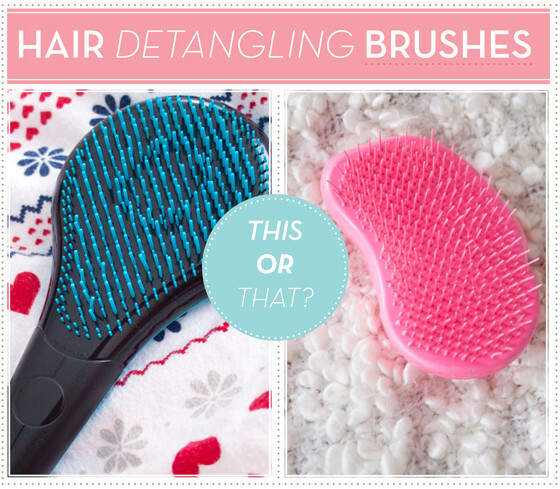 As I mentioned in my full review of the Michel Mercier Detangling Brush, I was planning to do a comparison of the Tangle Teaser and the Michele Mercier Brush. After a few hours of thinking (slow I know) low and behold a new feature was born. Introducing "This or That?" a brand new weekly (don't hold me to it) feature in which I will be comparing two similar products and deciding which one I think is worth spending your hard earned pennies on. So lets begin! Now, my hair is unruly, prone to matting and a real chore to brush. I've always hated brushing my hair, even when I was a little girl I'd fight it as much as I could. When I bought my first Tangle Teaser, it was like I'd had a moment on revelation and never looked back. It detangled and made my hair a whole lot easier to brush. Minimal effort, fuss free and super easy to use. My main problem with the Tangle Teaser is the fact it didn't have a handle. I find it always slips out of my hand and just often feels a bit too awkward in the palm. The bristles of the Tangle Teaser are pretty short and quite thin which I find bend quite a bit as it's being used. I have had to replace my Tangle Teaser twice as the bristles just wore down and bent over time. Michel Mercier brush contains 428 strategically placed bristles at varying lengths and heights which disperse pressure. These are also a lot thicker and sturdier and not as prone to bending unlike the Tangle Teaser. Overall I felt this brush didn't break my hair so much. Michel Mercier detangling brushes also come in three colour coded types depending on your hair type. I currently use the one for thick hair (despite my hair being fine!) and I've had no problems with it. I've only had this for a few weeks so I cant vouch for it's longevity but so far so good. To be perfectly honest these do the same type of job, There isn't much difference between the two except one has a handle and the other one doesn't. Personally I'd go with the Michele Mercier Detangling brush as it's just a lot easier to use. The traditional handle makes it glide through the hair with minimal effort. It's a touch pricier than your average Tangle Teaser at around £15 compared to the Tangle Teaser's £10 price tag. I think it's one of those things that if you want to spend the extra money on getting something designed for your hair type and with a handle then pay that little bit extra, if you're not fussy then stick with the easier to get hold of Tangle Teaser|!